Tom Arnold may not be thought of as the comedian’s comedian, or fit into the circles of comics at home among alternative rock bands, like Patton Oswalt or David Cross, but he’s got a genial sweetness to him, best expressed in the 2005 film, “The Kid and I .” Arnold wrote and starred in the feature, in which he played a down and out actor who gets a break to make a sequel to “True Lies,” but with a young man who has cerebral palsy as the star, since it will be financed by the boy’s family. That quality came through when Jester spoke with Arnold on the occasion of his upcoming stand-up special, “Tom Arnold: That’s My Story and I’m Sticking To It,” a first for him that will be premiering on Showtime on New Year’s Eve. Jester: How’s your co-star from “The Kid and I”? 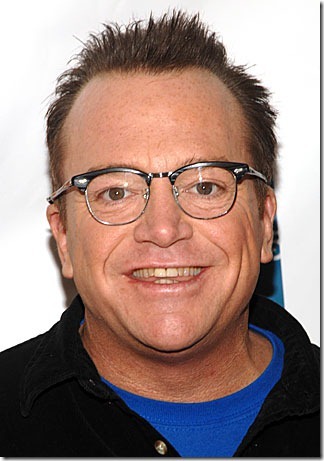 Tom Arnold: He’s doing well. He’s doing well. I saw him for dinner the other night. J: Do you hang out frequently? Arnold: He lives close to me. J: Will there be an update at some point? Arnold: Yeah, absolutely. I call him to see how he’s doing, and I’ll say, I talked to Michael, a friend of ours and he wants to know how we’re doing. J: So, have you been away from stand-up for awhile? Arnold: The last few years I’ve been doing it consistently. I started back in the early 1980s at the University of Iowa. Then I moved to Minneapolis for five years and honed my craft, as it were. But when I moved here [Los Angeles] in 1988, I moved out here as a writer, to write “Roseanne,” and that’s one thing about doing stand-up comedy, is you learn how to write. You also learn how to act a little bit. Once I got into writing the show, stand-up went to the side. I did it once in awhile; I didn’t do it as much. I never had a stand-up comedy special. I had HBO specials that were made with Judd Apatow, and I wrote sketches and different things. I always did that. My ex-wife was a great stand-up comic and she got several specials and I appeared on those. I never had a stand-up special like my peers. It was definitely on my bucket list. So I thought, ‘Can I do it?’ So I took a night at the Laugh Factory in Los Angeles, every Wednesday night. And I gave myself a year of working there and seeing what the audience remembered and what they knew and see if I could write an act and go on the road with that act from comedy clubs to some arenas, casinos and all different types of places, all over the country, North America. And see if I had what it takes and see what they wanted me to talk about, and what they remembered. They have long memories. So I had to talk about everything. If there was an elephant in the room, it had to be talked about. I gave it my best shot and Showtime came along, and they were kind enough to put me on New Year’s Eve, which is a big thing, I guess, and here I go. J: Is it going live on New Year’s Eve, or is taped? J: What are some of the topics on your mind in this special? Is it all new or do you recall some of your old material? Arnold: It’s chronological about my … 25 years of my life or a little more that I’ve been in this business. A lot of it is personal things – the funny personal things that have happened, the people I’ve met. Like what happened when I met Madonna, what happened when I met – when Hugh Grant and I met Madonna; my first marriage, what that was really like, and before we were married. And my other marriages, and marriage in general; and the [movies] I’ve made – just a lot about a guy from a small town in Iowa who gets a chance to be in some movies, and meet some fantastic people. And how you act when you meet them. I certainly didn’t grow up with a bunch of fantastic people. Nothing against the people I grew up with, they were great. In my days, I wanted everybody to like me. If I was in a movie with somebody, I wanted them to like me. That’s not always the way it turns out. They don’t have time for that.